Bio Miracle Bokutte Upa was planned for US release at some point, but eventually cancelled. 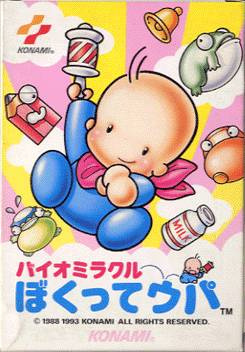 The only "new" game of the bunch is Bio Miracle Bokutte Upa (Bio Miracle Baby Upa), a Kirby-esque game starring a baby called Upa. This baby would later appear in a few of Konami's Parodius games as a playable character. Hopefully this and Smash Ping Pong will pave the way for more Konami imports - The aforementioned Parodius series (A few of its installments were released in Europe, however) and the Ganbare Goemon series are great picks, aside from the obvious Castlevania Dracula X: Rondo of Blood. The other two newly rated games were already rated by other groups. Gley Lancer was rated by the German USK a while back, although they now pulled the rating as they must have realized it was a VC title (They don't normally add VC ratings to their site). Super Turrican 2 was ESRB rated many months ago and still isn't out in the US, but seeing as Europe recently got Super Turrican and Mega Turrican it really was only a matter of time. I did wonder where Upa and Rupa came from but never cared enough to look it up. Bio Miracle Bokutte Upa looks interesting. The C64 wasn't too popular in Australia, so I don't think they'll be coming for a while, sorry. The... the... Upa game looks awesome. @Drake i didn't even know the C64 was never populer here but still i'm hopeful the c64 vc games will come here in australia as the c64 was my fathers first computer . But if it does come i will most probably download the same games as my fathers like Loco for example . I hope we do see the Parodius series on VC, as I thought they were great games, much better than their parent series. @Kelvin - Ya, Parodius on the SNES was great fun. Were they released on the PC-Engine? Seems to have been a system much better suited to shooters with a lot going on on screen. 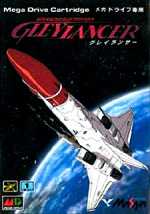 I love Parodius but I have to admit Gradius is my series of choice when you compare the two. I think you have to have a love of Gradius to really 'get' many of the jokes in Parodious. Yay! It's actually a good game, that one.